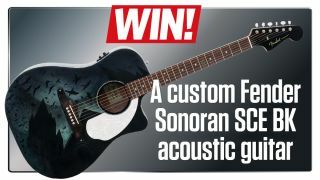 The kind folks at Fender have donated a California Series Sonoran SCE BK acoustic guitar to us to give away - and it's sure to get you noticed at your next black-metal open-mic night, thanks to its unique artistic makeover. The custom finish was created by Steph von Reiswitz, part of the Le Gun art collective, and Katatonia fans will recognise the design from the Swedish metallers' latest release, Sanctitude, which captures the band's stunning acoustic reworkings of their back catalogue at London's Union Chapel. According to her bio, Steph is a freelance illustrator with an impressive client list and apenchant for bent pens and sombre colours, whose favourite haunts include antiquarian booksellers, dingy harbour bars, defunct cinemas and cemeteries - the perfect fit for the dark, ambient-metal atmospherics of Katatonia. The winner of the competition will also receive a superb collection of the band's special editions, rarities, vinyl releases, boxsets and other merchandise.